I've finally have the chance to use some of the 'new' Brewtek yeasts I got earlier this year. Recultured the slants into 10ml of wort before stepping them up a couple of times (100m, 500ml). They are nearly ready to go now so should be brewing with the new grain and the 'new' yeast in the next few days. The yeast starters 2x CL400 (at the back) and a small CL930. 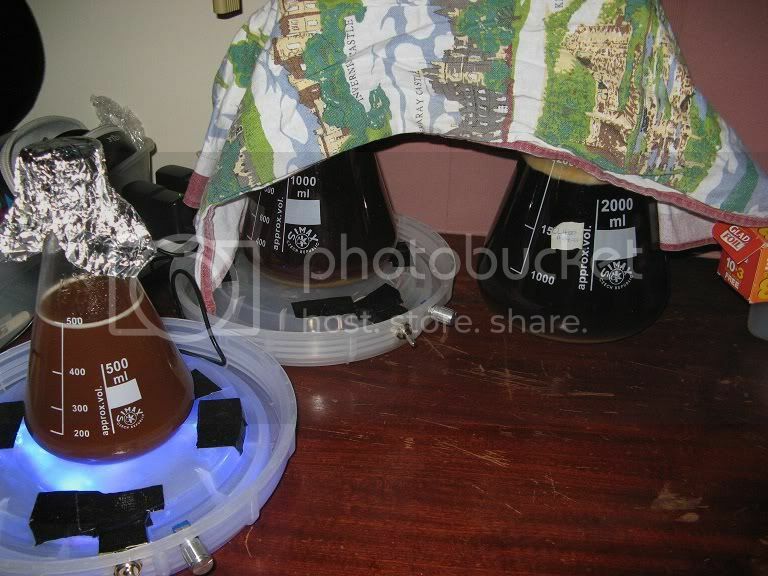 A number of books, online recipes and brewing software (such as BeerSmith) reference BrewTek yeast, these yeast strains were used very successfully in many home-brewed beers. Until about early 2003 Brewers Resource supplied BrewTek yeast (numbered as CL-#) on slants via their website. As of about 2004, Brewsters Yeast offered BrewTek strains , however in 2007 Brewsters Yeast also closed their operation. Since that time the only way to obtain BrewTek yeast (except in large volume or commercial situations) is via home-brewers who have saved this these yeasts at home or in their on labs.